For Standard Deviation Channel, it is possible to specify the mode of continuation of its display to the right (OBJPROP_RAY_RIGHT property). The mode of filling the channel with color can also be set. OBJPROP_DEVIATION property is used to change the value of the channel deviation. 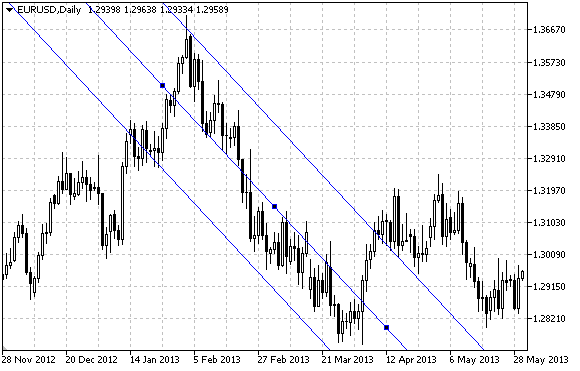 The following script creates and moves Standard Deviation Channel on the chart. Special functions have been developed to create and change graphical object's properties. You can use these functions "as is" in your own applications. #property description "Script draws \"Standard Deviation Channel\" graphical object." #property description "Anchor point coordinates are set in percentage of the size of"
#property description "the chart window."